On the Wing: A History of the Windsor Spitfires covers the history of the Squadron from its first inception in 1946/47, through it’s rebirth in 1975, to the team’s final two years, battling tremendous adversity to become two-time Memorial Cup Champions. 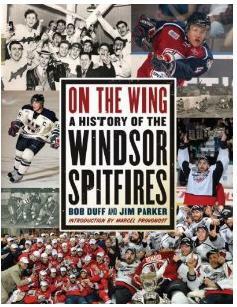 Complete with more than 150 photographs, many of them in colour, and many available for the first time, On the Wing offers a history of the team, its heroes, struggles and victories, and is a volume that no true Windsor Spitfire fan, or, indeed, hockey fan, should be without. Bob Duff has been a columnist with the Windsor Star for nearly 30 years, and has covered hockey, and the Spitfires for most of this period. He has authored or do-authored more than a dozen sports and hockey books, including autobiographies of Steve Yzerman, Bob Probert and Johnny Bower. Jim Parker has been a sports writer for the Windsor Star for two decades, and has covered the Spitfires for most of this period.